Adder DDX-CAM-DVI is a Computer Access Module (CAM) for the Adder DDX CAT7 Matrix KVM series. DDX-CAM-DVI features DVI video and USB for Keyboard/Mouse. 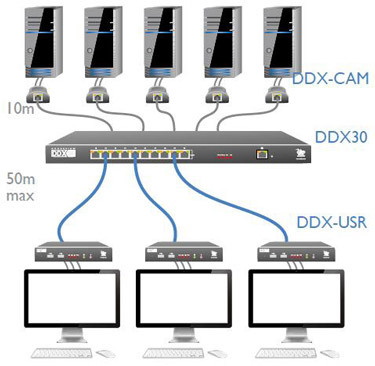 CAMs can be placed up to 10m* (32 ft) from the DDX 30 switch.